Tributes will flow today like the open sluices of Hoover, and surely the journos, commentators, cricket writers and fans will face an acute, frustrating crisis of words when putting pen to what goes through the heart. Language clearly fails us, there are instances where you find that Oxford Dictionary doesn't hold enough words in it, neither does M/s Google. There are times when you feel a void in your heart, so deep and wide that the Chicxulub asteroid had crashed into it. There are times when you'll be appreciated for the over production of lacrimal glands, because the emotions are genuine which controls your heart, and mind, which makes us humans, humans. It's just like waking up, after a long, beautiful, 'Inception'-istic dream in limbo. The world over, cricketers, analysts, journalists and critics have been generous when it comes to describing Sachin Tendulkar at work. Almost all the verdant adjectives have been showered on him. Sachin, without a shadow of doubt, was the most loved sportsperson on the planet; the adoration reaching unprecedented levels in India. A few pundits used their electron-microscopic eye to expose faults in the jewel, forgetting the one conspicuous point: Sachin is just another blue-blood homo sapien in flesh and blood. Sachin Tendulkar is a testimonial to enlighten us that perfectionism does not occur in nature. Sachin may be the near-perfect out of that horrible imperfects that we all are. What can one say? Is the word "#Thank you" enough for the rapturous joy we received in the last 2½ decades? "We miss you" is a mild way of expressing our feelings, here is where the problem of the earlier mentioned barrency with the English language. Personally, it's a hard pill for me to swallow; to accept that the journey which started when I was 9, when my household would wait anxiously and hopefully to see the little, wonderboy appear on field, is finally over. As I grew up, along with Sachin's career, the bond with him only strenghtened, with even my parents who didn't understand the spelling of cricket would sit down to watch Sachin play. 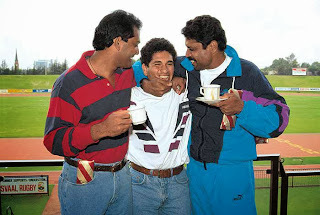 Such was the exception for Sachin that my draconian dad would allow me to watch Sachin's batting, just Sachin's batting, during the '96 World Cup which coincided with SSLC exams. I saw the lengthy phase of the young man who single-handedly had to shoulder responsibility of an Indian win, for over a decade, until the Ganguly-Dravid-Laxman era dawned. And 24 years later, as the incredible sojourn ends, it takes a while to envisage an Indian team, and the game of cricket, without Sachin Tendulkar, though he is now leaving it in a much healthy state than when he was inducted into it. Look it from Sachin's side, how many cricketing generations has he seen pass through? He has seen the likes of Gavaskar and Kapil bid adeau, he has seen Azhar, Sidhu and the likes fade out, he was right there when Ganguly, Kumble, Dravid came in , blossomed and left, he has seen the likes of Sehwag, Dhoni, Yuvraj and co taking over and blossom (and fade) and now he's overseeing Kohli, Rohit and Pujara bud. Its like watching over the whole world revolve from up there, but we still feel he is one from our neighbourhood. Sachin was able to cut a chord with the Indian middle class that made his the undisputed darling of the nation. India will ever get another one like him? It's an obvious no! I can still see the 18 year old Sachin when he celebrates after taking a catch. There's hardly one instance where he lost his cool in the quarter-of-a-century of limelight, on or off the field. The world is all over flukes like Beckham who is a hahahaaa when compared to Sachin. Wouldn't Sachin have a wry smile on his lips if he had seen the frentics by the LA paparazzis when the Beckham family made the much trumpeted American move? Sachin experiences a gross times that effect if he steps out anywhere in the world. Sachin should be, and will be a case study for what he was, not just due to his achievements or numbers, but for the way he presented as a role model to inspire billions, and to raise the bar by rigurous and continuous thrive to improve self, and most importantly, how to give and take respect. In the current social-media era when cricketers are instant celebrities, even the mediocre ones, Sachin always remained the ONE original hero. A family man to the core and a gentleman to the outside world, it bewilders me as to how some section of the population treated him. He has been accused of being 'selfish', placing personal goals and priorities before the cause of the nation. Now tell me how many times India lost or fortified a game because of Sachin? He has been the most selfless cricketer of our times, according to my book, who gave predominant priority to India before any personal goals. And who has Sachin scored all these runs for? That's a good thing to say about someone who contributed so much to Indian cricket.. He was different ever since he broke on the scene; unique not just because of his age, he appeared too young to ever bear the weight of his bat. The bleak match situation seemed suddently hopeful when he walked in at 5/6; there was a radical change in the momentum, the boy just so easily grabbed hold of the pivot. In a side filled with high-ranking seniors like Azhar, Kapil and Manjrekar, it was Sachin that induced panic in the oppisition ranks... Think of those early 90s matches in Sharjah, or outside the subcontinent and you'll know what I mean. Who brought the middle class housewives, stubborn husbands, nannies and grand-kids together in front of the TV when a cricket match was going on? Which cricketer ever single-handedly carried the dreams of a billion hearts whenever he appeared in the Indian colours? Did you forget the times when India was a one man army? And to play with a God-like status, commanding love, admiration and respect from all nook and corners of this world, for 24 years... its just mind boggling! Surely ridiculous, but this is where trust and passion takes over your head. Simple enough, blind faith makes your head believe that Sun revolves around the Earth. Faith which can move mountains, made the religious cricket fans believe their God can do nothing wrong. The element of disbelief and regression when Sachin's exploits failed to produce results was as a result of this disregard of fact: just another glorified ape like you, like me, albeit super evolve. And Tendulkar saga teaches us one bare fact. Sports, which often is a bonsai life, teaches you that however good you're, may be the best in business, you dont always win. The best dont always win. The one aspect I see in the legend, with all the charm he possessed he lacked the company of lady luck. I'm not talking about the countless dubious decisions the umpires gave aginst him but about the no of times his teammates let him down after he had played a gem. And who bear all the brunt? Sachin himself for being a choker.. The lady luck played a good part in taking the sheen off many poetic knocks, just because the other 10 cool-dudes bungled at their job. It's always been about his numbers for us, aint it? 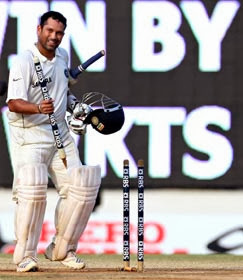 Cricket is THE GAME of numbers; take away the numbers from the game and see what you've got...The roar is more for the Sachin 100 than India's winning runs. Its not just about the 100 100s or the tens of thousands of runs but these numbers are what will define Sachin for the next gen. Just like 99.94 stands for Don for us. Numbers matter for the next gen to remember you, simple and plain. 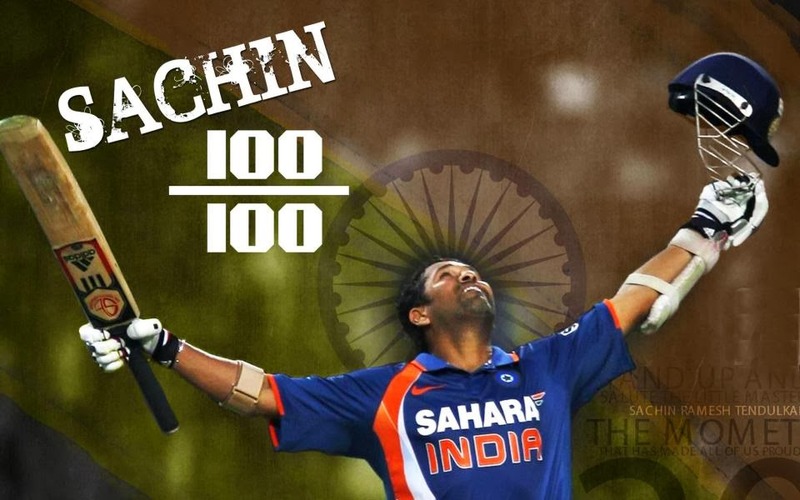 Sachin is something more than the 30k int'l runs, the 200* in Gwalior, the 0 in WC '03. Mere numbers which may be a statisticians delight, but he is something more..much more..
Perhaps someday, someone will cross the 100 ton record, the 200 Test mark or the total runs aggregate records, but to make millions lose sleep when he is batting on an overnight 90, to cause hundreds of fluttering tummy butterflies when he faces his first delivery or to cause pandemic disappointment and frustration when he misses another ton by a whisker... I doubt if anyone will create such waves. Runs...Sachin has almost become a synonym for it... Runs. The numbers are just staggering...so much up into the air that it would be like attempting to see Mt Everest's peak from Ground Zero. And its not just those mere mountain of runs; its the beauty and vigor in getting them. The stance, the poise, the effortless fluid style in which those runs were amassed depicts more of a classical poetry; perhaps what appeals to the senses of a knowledgable cricket watcher...more like how the splash of a Monet caricature stands out from those ubiquitous landscape paintings...how a Vintage Mercedes Engine flutters the heart of an automobile-phile. That is what makes Cricket looks different...the likes of Sachin,Waughs, Lara, DeSilva, Kallis or Dravid differs from en masse...They're poetry in motion. What makes Sachin the standout from all those great contemporaries was that he could make a bowler bowl where he wanted the bowler to bowl, he could rocket-propel to 3 figures in 71 balls as well as grind one out in 5 Test sessions, could hit an unbeaten 241 even when in poorest of touches, he could cut out his favourite shot for 10 hours and also as per many of his colleagues, could play 6 different shots to the same delivery. All aside, its 15921 + 18426. Try beating that! Reminds me the Tenali Raman tale of fable-age. Godess offered Tenali two pots: one for 'wealth' and other 'intelligence', asking him to choose one. Tenali fooled the Godess by requesting to taste them before drinking, and then gulping down both the cases. Sachin, bestowed with both affluence and an astute cricketing brain, lacked something quintessential: rub of green. Sachin's story has its own crests and troughs, his captaincy stints definitely one of those troughs, with injuries and lack of form threatening his career more than once. But as we look back, the Phoenix always rose up and flew higher when the naysayers thought it had crumbled down to ashes. Sachin had the tragic fate to lead one of the most lackluster teams of recent times with bowling standards, sans Kumble, were at club-levels. Such a shrewed and agile cricketing brain was all at sea when marshalling the forces, and perhaps the legend that great players never make great captains might be true. Whatever, the whole nation begged to get him off the Captain's seat, because we were missing Sachin the batter dearly. Those times as Indian captain still remain the worst years of Sachin, and he carried on the legend at the helm of Mumbai Indians. That is life...Anyone who'd think you can live your life tasting only sweetness is living in one hell of a deluded sphere. Even Sachin has had troughs; even Sachin, but you tell me one sportsperson who hasn't had tough times in a carrer spanning a youth-age...This is real life. And get your lesson; see how the man endured. He kept his head down, family close, believed in self and worked hard to redemption is 2008-09. Get your lesson. 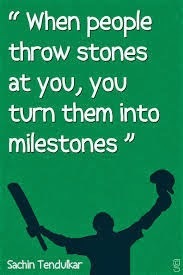 As Sachin famously said, he has managed to turn the stones thrown at him into milestones. And after 24 long years here's a call out to the critics. Where are thy all? 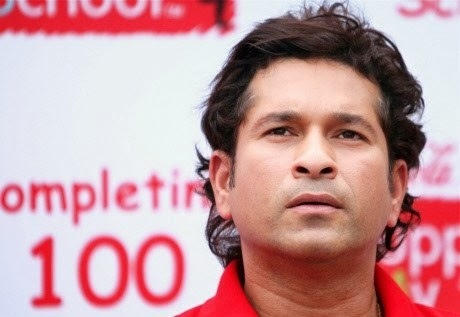 Sachin almost resembled the fine wine which mellowed with age, in those golden twilight of his career. The critics were grossly unfair to the man during the latter years of his career, asking him to hang his boots everytime his wicket fell cheaply. Even after meticulous hundreds with a strike rate of over 90, I've seen a desi-critic frowning over the number of dot-balls he faced. I remember after a hundred in Australia, Ian Chappel noted that Sachin didn't play the hook-shot during his innings, that he ducked to all the short stuff... What can one say about these guys?? Not just the Chappel guys but its a poetic justice to note that the whole bunch of critics had their foots stuck in the mouth after Sachin went on to prove in 2010 that the demons were still bubbling under the surface. Hard lesson for the unthinking critics, who dared to challenge the legend of the game. Sachin has warmed and won a million hearts zillion times than these fad critics and commentators ever did in their collective careers. In a team sport such as Cricket, to expect two slender clavicles to shoulder the dead-weight, literally the dead weights of the remaining 10 'warriors' against 11 opposition team predators time and time again, must be a walk in the park. Whoever thinks Sachin's hundreds did not help India win should check their numbers; it'd also help checking your heads before the numbers. Sachin has been more than just another cricketing hero. India will not get another role model like him in years to come. 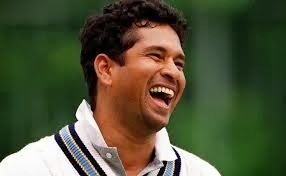 In people's heart Sachin will just be the 18 yr old boy who thrilled our senses for the best part of 25 years. Where in the world, or who in the world can replicate the scenes we saw at Wankhade today, the tears that he brought into the eyes of millions of his fans, commentators and critics from Mumbai to Melbourne, from Dubai to Darwin, from Manchester to Karachi, from the transistor radios of Delhi shantytowns to LED screens of sky-kissing penthouses...This is where the irreplacability of this man, the gravity of his achievements, create an awe in us. You can hit tons of tons, but earn the respect and admiration of your colleagues, opponents and other contrymen? Just try. That feels like Sachin. He became much greater than the game itself...not just in India. It's not an IQ 160 scenario to find out where the game is headed in post-Sachin era. Another Sachin won't be born; not in our lifetime. Cricket has lost it's last original class act. Cricket will never be the same again; it'll now be a rainbow in B&W. 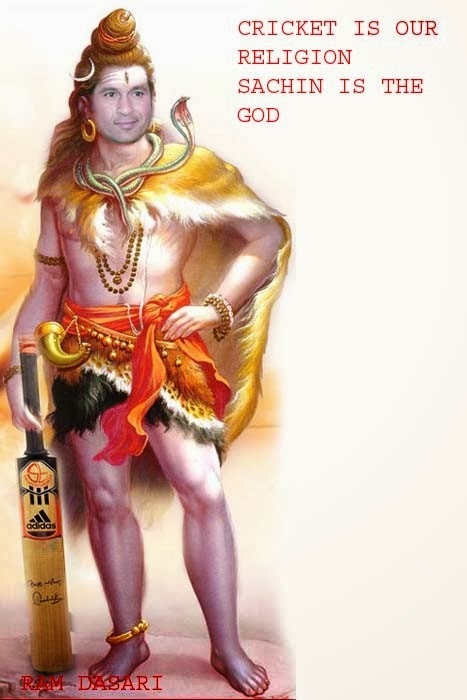 It is this which makes onedulkar, tondulkar, rundulkar and duckular amalgam into one mighty, little, immortal Tendulkar. Surely the most valuable treasure we are all proud of. The Bharat Ratna of our times. Befitting. This post has one title, one label, its enough. It's a huge privilege writing about Sachin here, I'm happy you're reading this and as I read the readied-draft I shockingly realise that I've failed appallingly to put my original feelings to words. Blogs can have infinite words, M/s Google? The world is not enough.